I recently rewatched the movie classic, Room With A View, based on E.M. Forester’s novel. Even though I have been to Florence more times than I can count, it is with fresh eyes every time I rewatch movie: the charming storyline, the Puccini arias — so beautiful they bring tears to your eyes, the timeless majesty of Florence. So it’s no surprise that many of our guests, like me, are Room With a View fans in search of their own “Room With a View” in Florence. 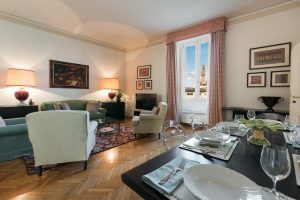 Our Vela, Caravella and Torella apartments fulfill those dreams with stunning panoramic views of all that is Florence. 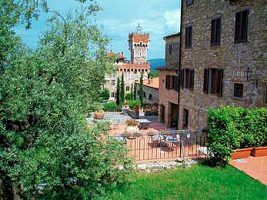 The three apartments are located in the same noble palazzo along the Arno river. If a picture is worth a thousand words, a video must be priceless. We hope you will enjoy this 1 minute video break then enjoy the sweet sound of Kiri Te Kanawa singing O Mio Babbino Caro. Italy offers an overwhelming number of traditional pasta dishes. The array of shapes, sauces, meats, and cheeses is daunting, and any true foodie will try them all! While spaghetti dates back to the twelfth century, the first formal recipe for spaghetti al pomodoro did not appear until 1839. This simple dish is often considered the original – consider it the Nonna (grandmother) of all great pasta dishes. The traditional recipe calls for fresh tomatoes, cooked with garlic, olive oil, and salt and served over al dente pasta. Fresh basil can be added for extra flavor. You can enjoy this dish anywhere in Italy, delicious everywhere.